According to his UC Davis webpage, Professor Emeritus William A. (Bill) Mason has served as the President of the American Society of Primatologists (ASP) and of the International Primatological Society (ISP). Presumably, his research is fairly representative of studies deemed significant and appropriate by these organizations. Mason worked at Harlow’s lab between 1954 and 1959. Mason is proud of his work. He lists 194 of his publications on his webpage. His publication list is filled with cruelty and suffering. Harlow published his last papers in the mid 1970’s (and one in 1980, a year before his death.) 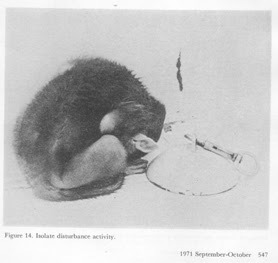 His last papers included “Effects of maternal and peer separations on young monkeys,” “Depressive behavior in adult monkeys following separation from family environment,” and “Induced depression in monkeys,” among others. So, what was Mason up to around the time when anybody with ordinary sensibilities and a respect for life was beginning to find Harlow’s work offensive? 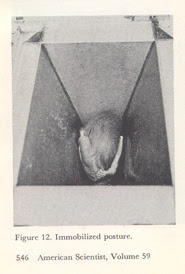 In the mid 1960s, Mason was hard at work emulating Harlow with studies like “Situation and stimulus effects on steroetyped behaviors of chimpanzees” and “Behavior of rhesus monkeys raised in isolation” both published in 1963. He published “Effects of rearing conditions on distress vocalizations in chimpanzees” in 1965. Mechanically driven mobile artificial mothers effectively prevented the development of stereotyped body-rocking in rhesus monkeys. Monkeys were maternally separated at birth and assigned to 2 groups. Both groups were placed with surrogates, identical in construction except that for 1 group the surrogate was in motion 50% of the time from 0500 hours to 2400 hours each day, and for the other group the surrogate was stationary. All but 1 of the 10 monkeys raised with stationary artificial mothers developed rocking as an habitual pattern whereas none of the 9 monekys raised with mobile mothers did so. The data also suggest that emotional responsiveness was reduced in monkeys raised with mobile mothers, compared to monkeys raised with stationary devices. 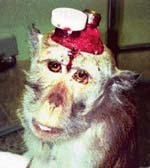 Didn’t Mason know by this time that raising monkeys alone with only inanimate surrogate mothers wounded their psyches? Behavior during competition for water was observed in 2 social groups of young rhesus monkeys (3 females, 3 males in each). Monkeys in one group were socially deprived and those in the other were socially experienced (raised with mother and agemates). Social status, based on dyadic recording of displacements at the water bottle, was predictive of a number of measures related to water consumption and social orientation in both groups, but this measure was less reliable and predictive for the experienced group than for the deprived groups, but this measure was less reliable and predictive for the experienced group than for the deprived group. A major reason for the comparatively low predictive value and reliability of status among experienced monkeys was their ability to influence the behavior of higher status members through responses directed to a 3rd party and other elaborate social strategies, many of which depended on responding to status relations between 2nd and 3rd parties. The fact that such strategies were only observed in the experienced group is a clear indication that the development of higher orders of social cognition is dependent on early social experience. “Contrasts in visual responsiveness and emotional arousal between rhesus monkeys raised with living and those raised with inanimate substitute mothers.” Wood BS, Mason WA, Kenney MD. J Comp Physiol Psychol. 1979 Apr;93(2):368-77. Rhesus monkeys were raised with dogs or inanimate surrogates in outdoor cages which provided them with complex, highly varied visual surroundings. Visual responsiveness to a variety of colored transparencies was investigated in three experiments, completed when the monkeys were between 18 and 30 mo old. Results indicated that the frequency and duration of looking at slides was significantly higher for dog-raised than for inanimate-surrogate-raised monkeys and that dog-raised monkeys were much more responsive to the novelty, complexity, ansal [sic] were obtained during the final experiment. Heart rate, vocalization, and changes in plasma cortisol were higher for monkeys raised with dogs. The frequency of most self-directed behaviors, however, was higher for monkeys raised with inanimate surrogates. Differences between rearing groups can only be the result of contrasts in attributes of the substitute mothers. I wonder whether people with ordinary sensibilities and a respect for life would have been offended that Mason was conducting these experiments. Thirty months of isolation, just to see what happens doesn’t seem very different from much of Harlow’s work. And what would a person with ordinary sensibilities do upon (yet more) unequivocal evidence that being raised alone, with no other living creature, screws up a monkey’s mind? Mason must have felt that the sensitive thing for a person like himself to do, a person with a respect for life, would be to leave monkeys in those woeful situations. The formation and expression of filial attachment was investigated in rhesus monkeys raised with dogs or inanimate mother substitutes in a longitudinal study spanning the first 4 years of life. At 2 months monkeys were identified within each rearing group as strongly attached or weakly attached, as measured by proximity, contact and clinging to the mother substitute in the living cage and in a novel room, and by differences in levels of distress vocalization and heart rate when they were alone and in the presence of the substitute mother in a novel room. By 4 months, all monkeys were attached, and the strongly attached and weakly attached monkeys of the first age-period were no longer distinguishable on any measure. The attachment was specific to the substitute mother. It was not exclusive, however, inasmuch as similar responses were elicited by a stranger of the same type as the substitute mother, although the stranger was less effective. The attachment figure was also influential when it could be seen but not touched. Evidence of attachment to the substitute mothers persisted until the end of testing at 44 months. Comparison of rearing groups support the hypothesis that the principal effect of living and inanimate mother substitutes is on responsiveness, rather than on the attachment process per se. It’s noteworthy that John P. Capitanio, Mason’s coauthor in the above paper, also has served as president of the American Society of Primatologists. He may be the subject of a future essay. From early in the AIDS epidemic, psychosocial stressors have been proposed as contributors to the variation in disease course. To test this hypothesis, rhesus macaques were assigned to stable or unstable social conditions and were inoculated with the simian immunodeficiency virus. Animals in the unstable condition displayed more agonism and less affiliation, shorter survival, and lower basal concentrations of plasma cortisol compared with stable animals. Early after inoculation, but before the emergence of group differences in cortisol levels, animals receiving social threats had higher concentrations of simian immunodeficiency virus RNA in plasma, and those engaging in affiliation had lower concentrations. The results indicate that social factors can have a significant impact on the course of immunodeficiency disease. Socially induced changes in pituitary-adrenal hormones may be one mechanism mediating this relationship. Can you imagine the conversations Capitanio and Mason must have had? The amygdala has been implicated in the mediation of emotional and species-specific social behavior. Humans with bilateral amygdala damage are impaired in judging negative emotion in facial expressions and making accurate judgements of trustworthiness. Amygdala dysfunction has also been implicated in human disorders ranging from social anxiety to depression to autism. We produced selective amygdala lesions in 2-week-old macaque monkeys who were returned to their mothers for rearing. At 6-8 months of age, the lesioned animals demonstrated less fear of novel objects such as rubber snakes than age-matched controls. However, they displayed substantially more fear behavior than controls during dyadic social interactions. These results suggest that neonatal amygdala lesions dissociate a system that mediates social fear from one that mediates fear of inanimate objects. Furthermore, much of the age-appropriate repertoire of social behavior was present in amygdala-lesioned infants indicating that these lesions do not produce autistic-like behavior in monkeys. Finally, amygdala lesions early in development have different effects on social behavior than lesions produced in adulthood. “The development of mother-infant interactions after neonatal amygdala lesions in rhesus monkeys.” Bauman MD, Lavenex P, Mason WA, Capitanio JP, Amaral DG. J Neurosci. 2004 Jan 21;24(3):711-21. As part of ongoing studies on the neurobiology of socioemotional behavior in the nonhuman primate, the authors examined the social dominance hierarchy of juvenile macaque monkeys (Macaca mulatta) that received bilateral ibotenic acid lesions of the amygdala or the hippocampus or a sham surgical procedure at 2 weeks of age. The subjects were reared by their mothers with daily access to large social groups. Behavioral observations were conducted while monkeys were given access to a limited preferred food. This testing situation reliably elicited numerous species-typical dominance behaviors. All subjects were motivated to retrieve the food when tested individually. However, when a group of 6 monkeys was given access to only 1 container of the preferred food, the amygdala-lesioned monkeys had less frequent initial access to the food, had longer latencies to obtain the food, and demonstrated fewer species-typical aggressive behaviors. They were thus lower ranking on all indices of social dominance. The authors discuss these findings in relation to the role of the amygdala in the establishment of social rank and the regulation of aggression and fear. Traditionally, the American Society of Primatologists has been led by mentally ill sadists if their research publications are any judge. Sadly and disappointingly, many of the ASP members are people with common sensibilities and a respect for life. But these members remain quiet about the cruel and meaningless experiments conducted by their fellow members and the ASP leadership. Primatology must attract not only sadists but cowards as well. The Animal Welfare Act (AWA, frequently referred to as the Act) is enforced by Animal Care (AC) [and here], a division of the Animal and Plant Health Inspection Service (APHIS), a unit of the United States Department of Agriculture (USDA). APHIS is required (and frequently meets its requirement) to inspect annually most U.S. laboratories using species of animals covered by the Act to ascertain whether they are operating in compliance with the Act. (The inspections are superficial; the frequently noted instances of non-compliance have little impact on a lab’s practices; but that’s another essay.) Invertebrates, fish, and purpose bred mice and rats (accounting for the overwhelming majority of animals used) and birds (except wild-captured birds) are exempt from the Act’s oversight and regulation. Federal facilities are exempt. Category E is reserved for animals likely to have experienced unalleviated pain or distress. It is much more common to see animals in Category E in reports from contract toxicology labs because animals are intentionally poisoned in such labs. When labs of this sort report that no animals were in Category E, it is a near certainty that they are intentionally lying. Why would a lab lie about the pain and distress category? The simple fact is that even APHIS inspectors – calloused by frequent exposure to the suffering in the labs –look more carefully at a lab’s procedures and practices when they see animals reported in Category E, and labs are required to append justifications for their decision to withhold anesthesia and/or analgesia if they report animals in Category E. It’s more paper work associated with a can of worms. The motivations for public universities not reporting animals in Category E are like those above, but are more likely to include other factors as well. Parkinson's disease is a neurological disorder usually diagnosed in persons over 65 years of age. Some of the symptoms include limb tremors, slow movement, and loss of balance. Dr. Golda Sherman [a hypothetical vivisector] studied the disease using an adult rhesus monkey model. Her basic procedure was to give regular subcutaneous injections of the neurotoxin N-methyl-4-phenyl-1,2,3,6-tetrahydropyridine (MPTP) over a period of at least 4 months. Then, after a stabilization period, Sherman evaluated the efficacy of various drugs for treating the animals. Many of the clinical signs of Parkinson's in the animals mimic those seen in humans. More often than not the monkeys required assistance with feeding, and this help was routinely provided by the research group. Recently, in collaboration with colleagues at another university, Sherman developed a research interest in using adeno-associated virus-based vectors (AAV2) that encode a therapeutic human gene as a potential treatment for animals with Parkinson's. Sherman's new IACUC protocol had three study groups: (1) MPTP only, (2) MPTP plus AAV2 without the gene of interest, and (3) MPTP plus AAV2 with the gene. The protocol called for the latter two groups to have the AAV2 injected intracranially using stereotaxic surgery. These AAV2-treated animals were to be placed in USDA pain/distress Category D (pain or distress alleviated by drugs) because of the surgery. The MPTP-only animals were to be placed in Category C (no pain or distress), the same category in which Great Eastern University had previously approved Sherman's studies. The protocol went through veterinary 'pre-review' without incident, and was then presented to the IACUC. At the full committee meeting one of the newer members raised two questions. First, if an animal was going to develop signs of Parkinson's disease, why place it in Category C rather than Category E (unalleviated pain or distress)? Further, why not consider the animals undergoing surgery as part of multiple major operative procedures? Malcolm Michaels, the IACUC Chairman, explained that because Sherman provided the non-surgical animals with adequate medical and husbandry attention, Category C was appropriate for them. Moreover, because only one invasive surgical procedure was being done on the remaining animals, there was no need to consider this study as encompassing multiple major operative procedures. Do you agree with the IACUC's determination that this is a Category C study for the non-surgical monkeys and Category D for the others? Should the IACUC consider Sherman's research as multiple major operative procedures on the same animal, or is it a single major operative procedure? Ellen M. Levee, DVM, Director, Department of Comparative Medicine, and Assistant Professor, Departments of Physiology and Pathology, New York Medical College, Valhalla, NY. "Response to Protocol Review Scenario: Gimme an 'E'"
Sylvia J. Singletary, DVM, DACLAM, Director, Division of Comparative Medicine, Institutional Veterinarian, and Assistant Professor, Physiological Sciences, Eastern Virginia Medical School, Norfolk, VA. "Response to Protocol Review Scenario: Depends on context"
Colleen A. Cody, BS, Associate Director, Animal Welfare Compliance, Novartis Institutes for Biomedical Research, Inc., Cambridge, MA. Jessica Hoar, LATG, CMAR, IACUC Manager II, Millennium Pharmaceuticals, Inc., Cambridge, MA. Cody and Hoar collaborated on their response, "Response to Protocol Review Scenario: Category E (with caveats)"
TESTIMONY OF STEVEN L. LEARY, D.V.M. Thank you for allowing me to testify today and for conducting this hearing on animal welfare. I am Dr. Steven L. Leary, Assistant Vice Chancellor for Veterinary Affairs at Washington University. I am testifying today on behalf of the National Association for Biomedical Research (NABR). NABR is the only national, nonprofit organization dedicated solely to advocating sound public policy that recognizes the vital role of humane animal use in biomedical research, higher education and product safety testing. Founded in 1979, NABR provides the unified voice for the scientific community on legislative and regulatory matters affecting laboratory animal research. NABR’s membership is comprised of more than 300 public and private universities, medical and veterinary schools, teaching hospitals, voluntary health agencies, professional societies, pharmaceutical and biotechnology companies, and other animal research-related firms. NABR, like essentially every special interest group focussed on maintaining the flow of public funds into private coffers, makes false claims intended to sway uninformed lawmakers. They commonly present false or erroneous claims under the guise of historical fact or current regulatory reality. Given that the IACUC is the keystone of the Act, the fact that Dr. Leary is wrong about this very basic fact should make us wonder whether he has gotten other basic things wrong. ...[W]e conducted a study of randomly selected IACUCs from U.S. universities and colleges. Seventy committees were drawn from a master list of 916 IACUCs maintained by the U.S. Office for Protection from Research Risks. Of these 70, 50 agreed to participate in the study. Thirty-four IACUCs came from research or doctoral universities, seven came from master's colleges or universities, six came from specialized institutions (e.g., medical colleges), and three came from liberal arts colleges. In all, 494 of 566 voting members (151 females and 343 males), or 87% of those approached, took part in the study. Each IACUC was asked to submit its three most recently reviewed protocols involving animal behavior, including the committee's decision on whether to approve the research in question. All information identifying the investigator or institution was then removed from the protocols, and each protocol was randomly assigned to be reviewed a second time by another participating IACUC. Voting members of the second committee were sent packets containing three masked protocols with a request to review the protocols and to send us a completed evaluation anonymously in a prepaid envelope. Once we received reviews from individual committee members, the IACUCs were asked to meet as a group and render a final evaluation for each of the three protocols. Committees were asked to follow their standard operating procedures and to discuss the protocols as they would any other research proposal. Every research facility in the country receives at least one unannounced USDA inspection annually. Whether intentionally or out of ignorance, NABR's offical spokesperson, Dr. Steven L. Leary, misled the House Committee on easily verifiable facts such as the regulatory requirements for the makeup of Instituational Animal Care and Use Committees (IACUCs) and the effectiveness of both the IACUC system and the USDA animal research laboratory inspection system. Maybe it's unfair of me to expect an Assistant Vice Chancellor for Veterinary Affairs at a major research university who is acting as an NABR spokesperson to be reasonably informed. But given the clear fact that he isn't, it is not surprising that his speculations are also based on something other than evidence. What evidence would be sufficient to debunk such a claim? When Leary says, "virtually" does he mean some, most, a few? How many examples contradicting his claim would be sufficient? I won't launch into a rebuttal of each of his silly claims here; I urge readers to visit the Americans For Medical Advancement website and peruse some of the very many articles there written by scientists and medical doctors who question the absurdity of claims like Leary's. The newest case is Andrew Speaker, whose story has generated intense news coverage. The main theme has been that he was diagnosed with tuberculosis, advised not to travel, did so any way, and exposed many airline passengers to the potentially deadly disease. XDR TB stands for extensively drug-resistant tuberculosis. This drug-resistance makes it a potentially serious pandemic and lethal agent, especially if it were to mutate (or be bioengineered) into a highly virulent strain. There are many problems associated with Dr. Cooksey's statement. The first, and one that alerts us to question the rest of his claims, is the idea that Speaker would not have immediately conferred with his soon-to-be father-in-law TB expert upon learning that he had a baseball-sized TB lesion in one of his lungs. Cooksey says, "I wasn´t involved in any decisions my son-in-law made regarding his travel." He let his daughter go off with a TB patient, jet around the world, and yet says, "First and foremost, I am concerned about the health and well being of my son-in-law and family, as well as the passengers on the affected flights." Something smells very rotten here. Second, the coincidence of Speaker's rare disease and his father-in-law's research strains credulity. Forty-nine cases in the US in 13 years, and one just happens to be the fiance of the daughter of scientist studying this rare disease. Third, the fact that Cooksey has never tested positive for TB is not necessarily proof that he wasn't the carrier. TB is member of the genus Mycobacteria, known for its unusually tough cell wall. Mycobacteria can take years to culture, and Mycobacteria tuberculosis, the causative agent of TB, can take four weeks to culture, and remains viable for hours in its airborne state. Even if TB spores were inhaled by Dr. Cooksey, he might not have become infected. Exposure is not a guarantee of infection. Given the toughness of the organism it isn't impossible that he might have carried the spores in his lungs and out of the lab. Fourth, Cooksey's claim that CDC's labs operate "under the highest levels of biosecurity" is not reassuring. CDC has made erroneous claims in the past such as the claim that the animals in its labs are well cared for. Other labs operating "under the highest levels of biosecurity," like Plum Island, have been somewhat less than secure and may have been the source of significant public health risks.